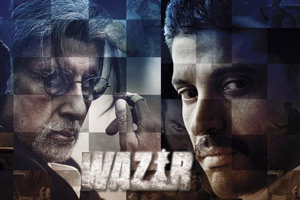 Wazir is a 2016 Bollywood action thriller film directed by Bejoy Nambiar and produced by Vidhu Vinod Chopra. The film is written by Abhijat Joshi and Vidhu Vinod Chopra,. It stars Amitabh Bachchan & Farhan Akhtar in lead roles along with Aditi Rao Hydari, John Abraham. Neil Nitin Mukesh and Manav Kaul in supporting roles. The soundtrack of the film is composed by Shantanu Moitra, Prashant Pillai, Advaita, Ankit Tiwari while lyrics are written by Vidhu Vinod Chopra, Swanand Kirkire, A.M. Turaz, Abhijeet Deshpande, Manoj Muntashir. Here is the link of all the songs lyrics and videos of Wazir.